General Tran Dai Quang has officially become Vietnam's new President after he won in a secret ballot election held by the National Assembly in April 2. Quang, former Minister of Public Security, was the sole candidate recommended by the NA Standing Committee for the position of president. He took an oath of office at his inaugural ceremony, making him the second state leader to perform the practice after newly elected Chairwoman of the NA, Nguyen Thi Kim Ngan. In answer to why there were no extra candidates for the state’s top position, Secretary General of the NA, Nguyen Hanh Phuc, said that delegates have the right to self-nominate and nominate others after the Standing Committee had put forward its proposal for president. However, there was no other nomination. 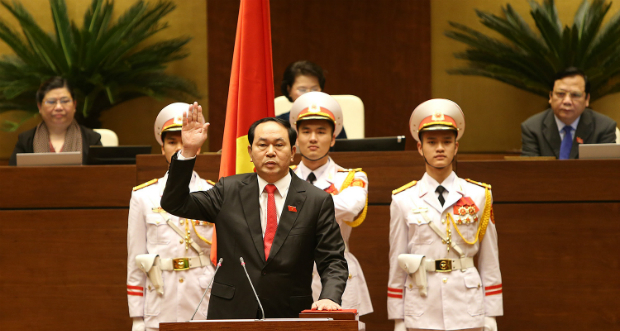 According to the constitution, Quang’s presidency grants him influence over domestic and foreign affairs and positions of the commander-in-chief of the army and the chairman of the National Defense and Security Council. Deputy Nguyen Thi Kha said that she hopes a new president will be able to assert his roles. “I hope the President will show a stronger response in protecting the independence, sovereignty and territorial integrity, especially to gather the support of countries around the world and solve the maritime issue on the basis of law, not confrontation,” she said. Sixty-year-old Tran Dai Quang originates from Ninh Binh. He is a professor with a Ph.D in Law, and has held the positions of Director General of Department of Security Advisory, Director General of Directorate of Security and Deputy Minister of Public Security. In 2011, he was appointed Minister of Public Security in the first session of the 13th National Assembly. In the same year, he was promoted from lieutenant general to colonel general, and to general a year later. He was member of the Party Central Committee 10, 11, 12; a member of the Politburo 11, 12; and a delegate of the 13th National Assembly.